Credit cards were introduced as early as the 1900’s by department stores and oil companies. These propritary cards were created to build customer loyalty. It wasn’t until 1946 that a universal credit card called Charg-It came into use, and now we view credit cards as a matter of convenience. Who could have known that this little piece of plastic would cause so much chaos and debt in the years to come. 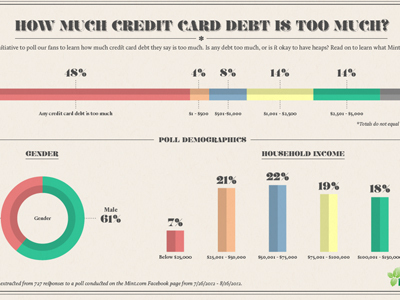 According to the United States Federal Reserve Bureau of Statistics the total U.S. credit card debt is 793 billion, and the average credit card debt per household is $15,789. Since these figures are as of October of 2012, 26 percent of the households debt has actually increased in a 12 month period since. I didn’t really find this whole debt topic that interesting until I started to become more concerned with our National Debt. There are days I wish I could just raise my own debt limit and then not pay it back. Isn’t this an “official law” our government is introducing? Here’s another fact that you might find interesting. In the early days of credit card distribution, credit card companies would send applications through the mail to west coast residents while their processing center was on the east coast. You might wonder, big deal. Well, knowing that people wait till the last day to pay their bills, the credit card companies anticipated the distance from west coast customers to their east coast processing center would produce added late fees. This was due to the lapse in mail delivery, and they were right; this practice has since been stopped – so they say. 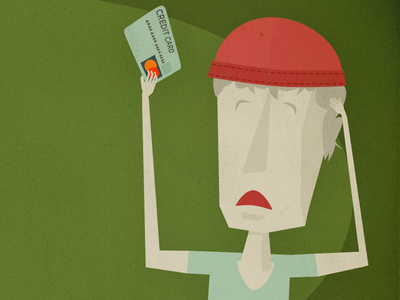 In a society where “we gotta have it now,” the credit card can either be your friend or foe. We want instant gratification without considering the consequences. Credit card companies know this about human nature and they count on you maintaining a balance for a very long time. The number of people who payoff their balances monthly is quite low. The customers who do payoff their balances monthly are called “freeloaders.” There are surely other names used in the industry (we can’t repeat), but you get the idea. The problem with instant gratification is, for most people the cost is high. The interest rates are high and the debt can become unmanageable. This leads many households into financial stress or even bankruptcy. I don’t even know if you can or should calculate sky rocketing interest payments into your budget and cash flow. Credit card companies make it even easier to run up balances by issuing credit card checks. All a customer needs to do is use these checks to make a purchase, or they can just deposit it in their bank account as cash. By using these checks the customer can incur a one time fee, and/or a higher interest rate on the balance because it’s considered a cash advance. The holidays are a popular time for customers to use these checks, and in the excitement of holiday giving many people feel the financial hangover when the bill comes the following month. You see, credit turns into debt when used. It’s much easier to hand over a piece of plastic compared to having to dish out cold hard cash, when making a purchase. Is the consumer totally at fault for these credit card pitfalls? It depends who you talk to, but lets say between being bombarded with multiple offers in your mail box, the temptation of “buy now-pay later” offers, and a lot of fine print on the credit card disclosure statements (that even lawyers can’t decipher), the temptation to consumers is far more than most can resist, and the credit card companies know this – in fact, they count on it. If you’d like to read more detailed info on the History of Credit Cards click on this link. I never heard the term “freeloaders” before. Most banks refer to people who pay their balance in full as “transactors”. Each time someone uses the card the merchant is charged a fee of around 3% of the sale. The fees are split between the merchant processor, the card association, and the bank. Many banks earn quite a bit of interchange income from these “freeloaders”. Yea, it’s not used very much. The money banks make off interest is far higher than interchange income which is why they want us to carry over balances. Here’s an excerpt from Investopedia. For issuers, the best-case scenario is for card-carrying customers to have credit balances month to month. The official industry terminology for them is “revolvers”. It is rather despicable how credit card companies lure customers into making impulse purchases that they cannot afford. If you ask me, I think the bigger blame lies on the company’s shoulders because they have a duty to be socially responsible while generating profits. Of course, consumers are to be blamed too for falling into their traps – it’s a free choice they make when using their credit cards and for not paying their bills before the month ends.